We have some gorgeous art to share in our ABCs and 123s letter and math series today. Amanda from Artsy Momma and her daughter are sharing how to make a circle book, and it’s delightful! 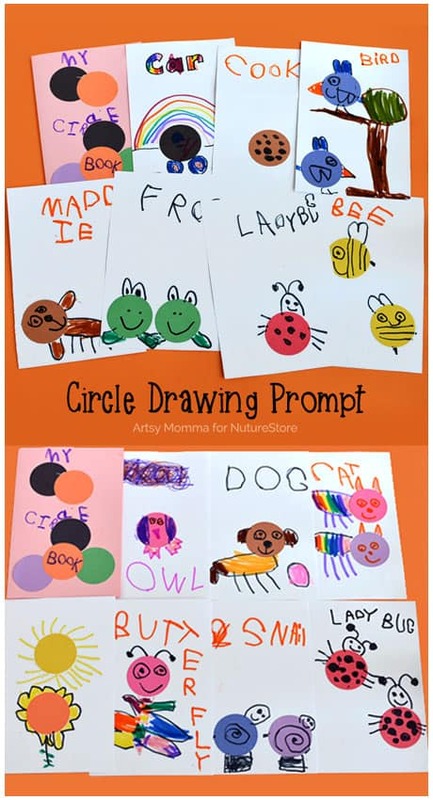 This circle drawing prompt activity is a great way to foster creativity and thinking outside the box while learning how circles fit into our day to day lives. Little Sister (5 yrs old) absolutely loved making her own ‘My Circle Book’ and coming up with ideas. 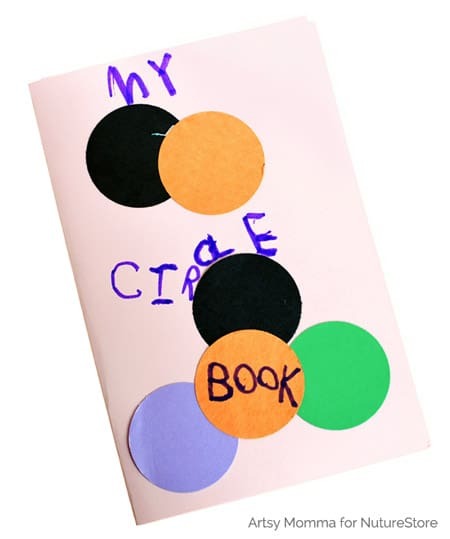 It turned out to be a fun way to combine a structured activity while still allowing her to be in control of what’s inside the book – colors, number of circles used, placement as well as what to draw with each circle. This page contains affiliate links. NurtureStore gets commission for purchases via these links. 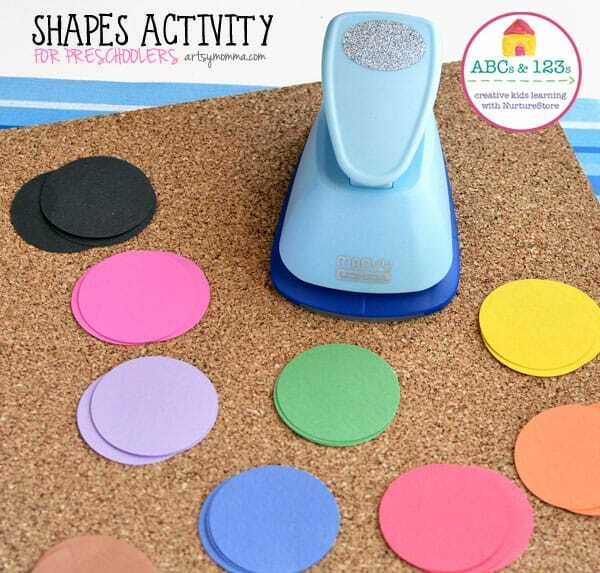 Use the paper punch to make circles in different colors of either cardstock or construction paper. Kids can do this part themselves! Alternatively, you could trace a circular object and cut the shapes out using scissors. We made three of each color. Make a book cover by folding a sheet of paper in half or even a cereal box would work. Create book pages by cutting a small stack of white paper in half using either a scissors or a paper cutter. Optional: Make holes with a hole puncher in all the sheets as well as the cover. Use string or yarn to tie it together. Talk about the different things that are circle-shaped such as a ladybug, ball, and frisbees. 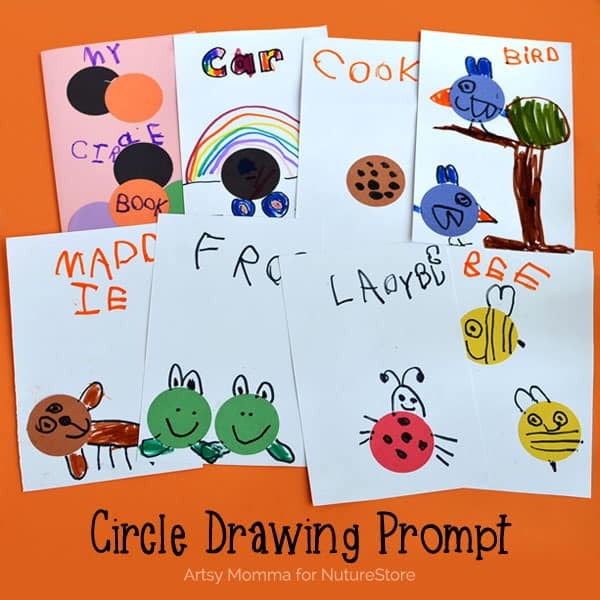 Ask your preschooler to choose a circle and decide what to make it. As an example, Little Sister chose to make 2 ladybugs. She glued 2 red circles on a page and then drew on ladybug dots, legs, face and antennae. Aren’t they the cutest? They make me smile every time I look at them! Flip the page over and start over with different colored circles. They can even use it as a head shape like Little Sister did for her dog and cat drawings. On each page she practiced writing by having me spell the word for each item she drew. What can you think of to make with these colorful circles? 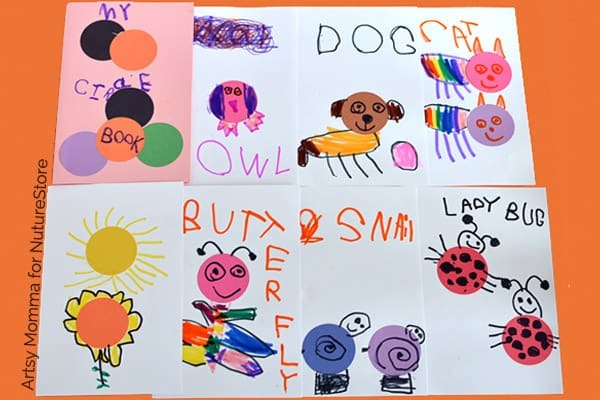 Dogs, cats, ladybugs, bees, birds, frogs, sun, flower, car, snail (I was super impressed when she came up with that one! ), butterfly, cookie. Don’t forget to have them write their name, age and the date on the cover somewhere! It makes a wonderful keepsake and something they can look at over and over again or add to over time. For the past 2 years we have collaborated with other bloggers to do a twice-a-month preschool theme together. We would love for you to check out our creative preschool learning themes for more ideas and inspiration! This jumbo-sized alphabet hunt is a fun way to practice beginning sounds and letter recognition. Work on fine motor skills with this spider web number lacing activity and ABC snail craft. Amanda is an ‘artsy momma’ to 2 kids who love making crafts just as much as she does. Follow their creative journey over on Artsy Momma where they share crafts, fun food ideas, learning through play, mommy DIY, + lots more! If you love handprint crafts, head over to Fun Handprint Art where you will find hundreds of their projects all made with little hands and feet! All our favourite literacy and math activities, all in one place :: download our ABCs and 123s guide here.